With the rapid development of high-throughput technologies, researchers can sequence the whole metagenome of a microbial community sampled directly from the environment. 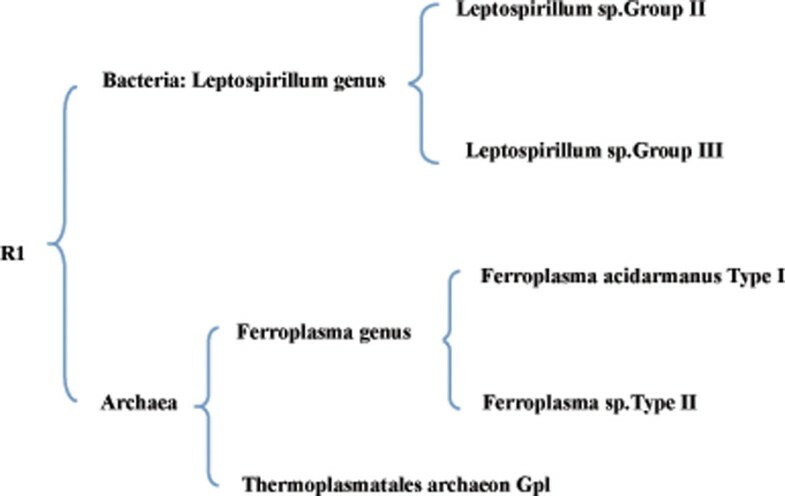 The assignment of these metagenomic reads into different species or taxonomical classes is a vital step for metagenomic analysis, which is referred to as binning of metagenomic data. In this paper, we propose a new method TM-MCluster for binning metagenomic reads. First, we represent each metagenomic read as a set of "k-mers" with their frequencies occurring in the read. Then, we employ a probabilistic topic model -- the Latent Dirichlet Allocation (LDA) model to the reads, which generates a number of hidden "topics" such that each read can be represented by a distribution vector of the generated topics. Finally, as in the MCluster method, we apply SKWIC -- a variant of the classical K-means algorithm with automatic feature weighting mechanism to cluster these reads represented by topic distributions. Experiments show that the new method TM-MCluster outperforms major existing methods, including AbundanceBin, MetaCluster 3.0/5.0 and MCluster. This result indicates that the exploitation of topic modeling can effectively improve the binning performance of metagenomic reads. Due to the limitations of biological experiments, traditional microbial genomic studies focus on individual bacterium genomes. However, microorganisms in an environment often have various functional effects on each other. For example, the diversity of microbes in humans has been shown to be associated with common diseases such as Inflammatory Bowel Disease (IBD)  and gastrointestinal disturbance . Metagenomics (Environmental Genomics or Ecogenomics) is an area that studies the genetic materials recovered directly from environmental samples such as human guts, soil, dust from air conditioners, and so on. With the rapid development of next-generation sequencing (NGS) technologies, we can directly sequence the DNA reads of multiple species obtained from the mixed environmental DNA samples. Metagenomic reads are from multiple microorganism genomes, and usually the microorganism species of most metagenomic reads are unknown. A crucial step in metagenomic analysis is to group DNA fragments from the same species together. This task is referred to as binning of metagenomic reads . So far, a number of computational methods have been proposed by researchers to tackle this problem. These methods roughly fall into two major categories: similarity-based methods and composition-based methods. Similarity-based methods first aligns metagenomic reads to known genomes, and then group reads according to the alignment result. One typical similarity-based method is MEGAN . Obviously, this type of methods does not work when the microorganism genomes are unavailable. Composition-based methods usually adopt supervised techniques to assign reads to different groups. The features are directly extracted from the nucleotide sequences, including oligonucleotide frequencies, GC-content, codon usage etc. Up to now, SVM , naïve Bayes , KNN , Interpolated Markov model  etc. have been used to bin metagenomic reads. However, the performance of these methods still relies heavily on the availability of known genomes, which are used as training samples. To overcome the drawbacks of the methods above, unsupervised or semi-supervised techniques were proposed to deal with metagenomic data from unknown species. Wu et al  proposed a method called AbundanceBin that extracts k-mers from sequence reads and bins reads based on the coverage of their k-mers, which can separate reads of very different abundance ratios. However, AbundanceBin does not work well when the datasets consist of reads of identical abundance ratios. Leung et al. developed the MetaCluster 3.0 method that uses 4-mers to build the feature vectors. It first groups the reads into many small clusters by the K-median algorithm, then merges smaller clusters to larger ones so that sequences from species of low abundance ratios can be grouped into isolated clusters. MetaCluster 3.0 outperforms AbundanceBin on both evenly and unevenly distributed datasets with reads of 1000 bp. Later, Wang et al. introduced two improved versions of MetaCluster 3.0, which are MetaCluster 4.0  and MetaCluster 5.0 , for the purpose of processing short reads. MetaCluster 4.0 can deal with short reads less than 500 bp by first concatenating short reads to longer ones based on sequence overlapping. However, it can not bin reads of low abundance. MetaCluster 5.0 is an extension of MetaCluster 4.0 for handling reads of low abundance. Recently, Wang et al. developed MetaCluster-TA , an assembly-assisted binning-based annotation tool for taxonomic annotation of reads. It assembles reads into long "virtual contigs", and then applies a method like MetaCluster 5.0 to clustering these contigs and reads, and finally assigns all resulting clusters to a taxonomy. The series of MetaCluster algorithms can automatically determine the number of clusters, which is extremely important for binning of metagenomic reads as most samples are from unknown species in real datasets. We also recently proposed a novel unsupervised method called MCluster for binning metagenomic reads . MCluster uses N-grams to extract sequence features and automatic feature weighting to improve the performance of the basic K-means clustering algorithm. Experimental results show that MCluster achieves obviously better overall performance than AbundanceBin and MetaCluster 3.0 on long metagenomic reads; while compared with MetaCluster 5.0, MCluster obtains a larger sensitivity, and a comparable yet more stable F-measure on short metagenomic reads. In this paper, we try to boost the performance of MCluster by using probabilistic topic modeling to represent DNA sequences, and develop a new approach TM-MCluster, which is the abbreviation of Topic Model based Metagenomic reads Clustering. 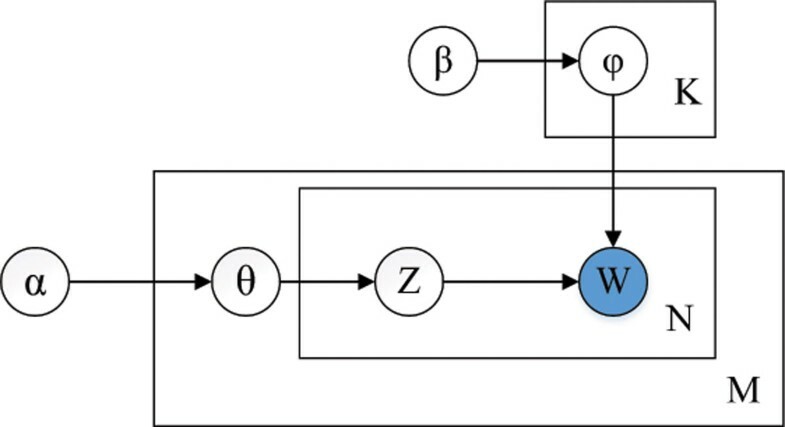 The approach consists of three steps: 1) representing reads by vectors of k-mers with frequencies; (2) transforming the frequency vectors of reads to topic distribution vectors based on the topic model LDA , and 3) clustering the transformed reads by the SKWIC algorithm , as in MCluster . We evaluate the new method with both simulated and real datasets, and compare it with four typical existing binning methods, including MetaCluster 3.0/5.0, AbundanceBin and MCluster. Experimental results show that TM-MCluster outperforms the four existing methods over most tested datasets. 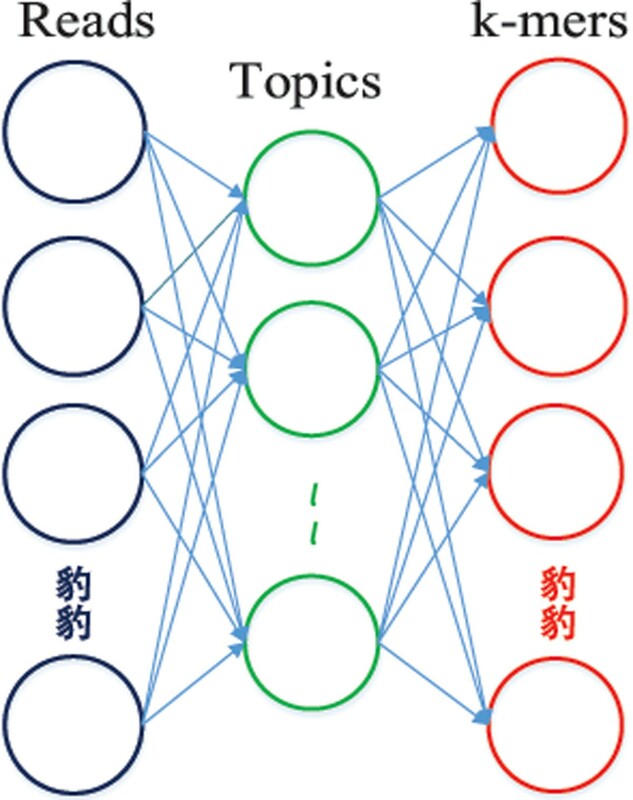 Note that in machine learning and natural language processing, topic models are a type of statistical models for discovering the hidden "topics" in a collection of data. Topic models were originally proposed for text processing, later were extended and applied to image and audio as well as music processing. Recently, some researchers applied topic models for biological data processing, such as mining protein-protein relations from MEDLINE abstracts of biomedical literature [17, 18], constructing mRNA module collections  and studying the functional groups of metagenomics samples . However, there is no work that applies topic modeling to metagenomic reads binning. The proposed method TM-MCluster consists of three major steps: 1) representing each read as a vector of k-mers with occurring frequencies; 2) transforming each read vector to a topic distribution vector based on the Latent Dirichlet Allocation (LDA) model ; 3) clustering the vectorized reads by the SKWIC algorithm , as in the MCluster method . Figure 1 shows the pipeline of TM-MCluster. In what follows, we give the detail of each step. The pipeline of the TM-MCluster method. Generally, the term k-mer refers to a sub-sequence of k consecutive characters in a sequence. Metagenomic data consists of many reads from different species, we use k-mers as the features of reads. There are at most 4 k k-mers in a DNA sequence as there are 4 different DNA nucleotides (A,G,T,C). So a read corresponds to a vector of k-mers with their frequencies occurring in the read as the vector component values. To reduce computation cost, the value of k should not be too large. Actually, different k-mers have different significance in describing DNA sequences. As shown in [21, 22], k = 4 is the best among k = 2 to 7 to represent DNA sequences. So we use 4-mers to represent metagenomic reads for binning. Concretely, we slide a window of length 4 to count the frequency of each k-mer in a read. Here, for each 4-mer, its complementary sequence on the other chain of the DNA sequence is also considered. So the dimensionality is 256 for each read. Topic models were originally proposed to discover latent topics from a set of documents that are represented by the bag-of-word model. Latent topics indicate implicit semantic topics in documents, which have been shown to be more effective in describing the semantic relationships among documents than traditional keyword based models. In metagenomics, reads can be seen as documents and k-mers as keywords in documents. Reads from the same species should share more similar latent "topics" than reads from different species. So "topics" may be more effective than k-mers in describing metagenomic reads as far as the binning problem is considered. Here, we use the Latent Dirichlet Allocation (LDA) -- a popular topic model from machine learning area . In what follows, we first introduce the LDA model, and then describe how to employ the LDA to extract latent topics from metagenomic reads. Figure 2 illustrates the LDA model. The outer plate represents documents, while the inner plate represents the repeated choice of topics and words within a document. 3 For each word w i of the d-th document, choose z i ~ Multinomial(θ d ), and sample w i |z i ~ Multinomial ( ϕ z i ) . where w −i is the current assignment k-mers except for w i , z - w i is the current assignment topics of all k-mers except for w i , n - i , j w i is the total number of k-mers assigned to latent topic j except for the current k-mer w i , n - i , j d is the total number of k-mers except for w i in read d that have been assigned to topic j, n - i , j * is the total number of k-mers except for w i assigned to latent topic j, and n - i , * d is the total number of k-mers except for wi in read d. In our model, we assume symmetric priors and set α = 0.1, β = 0.01. Such a parameter setting is to make topic modeling results more diverse. After training a LDA model, we can get the topic distribution of each read. Figure 3 illustrates the application of LDA to metagenomic reads. The left layer represents the DNA reads, the middle layer represents topics, and the right layer represents k-mers. We use the topic distribution of each read to represent the read. As the number of topics is usually smaller than the number of k-mers, this process is equivalent to dimension reduction. Here, the number of topics is a tunable parameter. In our experimental study, we set it to be 20 and 100 for simulated data and real data, respectively. Applying the LDA model to metagenomic reads. where K is the number of clusters, n is the number of dimensions, which denotes the number of topics used to represent each read here. X i is the set of reads in cluster i, v ik is the weight of cluster i in dimension k, D w c i j k is the distance between read j and the center of cluster i along dimension k.
In this objective function, we should choose a distance metric to compute the distance between reads. According to , Manhattan distance achieves the best performance in clustering biological sequences, compared to Euclidean and cosine distances, so here we also use Manhattan distance. v i k = 1 n + 1 2 δ i ∑ x j ∈ χ i [ ∑ l = 1 n D w c i j l n - D w c i j k ] . δ i ( t ) = K δ ∑ x j ∈ χ i ( t - 1 ) ∑ k = 1 n v i k ( t - 1 ) ( D w c i j k ) ( t - 1 ) ∑ k = 1 n ( v i k ( t - 1 ) ) 2 . 6 Update δ i by Eq. (5). In this section, we evaluate the performance of our method on both simulated and real datasets. We compare our method with four existing methods: MetaCluster 3.0/5.0, AbundanceBin and MCluster. MCluster is the latest unsupervised method for metagenomic data binning. The datasets were simulated by MetaSim  -- a sequencing simulator for genomics and metagenomics. We generate the synthetic metagenomic datasets with sequences sampled from species of various abundance ratios. As MetaCluster 3.0 works well only on long reads, we simulated long reads with different abundance ratios and species numbers (from 2 to 10): 16 datasets denoted by from D1 to D16; relatively-high abundance reads (50 k and 500 k reads) were also generated as AbundanceBin was designed for high abundance reads binning: 10 datasets denoted by from S1 to S10. Details of the datasets are listed in Table 1 and Table 2. Simulated datasets of low abundance (read length is 1 kbp on average). Simulated datasets of relatively-high abundance (read length is 1 kbp on average). Nowadays, real metagenomic datasets containing millions of short reads (< 500 bp) are very common, so we simulated two datesets containing one million reads of 75 bp, belonging to 20 and 50 species respectively, which are denoted as Dataset-A and Dataset-B. Among the 20 species in Dataset-A, five species have a relative sequencing depth 1×, another five species have a relative sequencing depth 3×, the third five species have a relative sequencing depth 5×, and the remaining five species have a relative sequencing depth 10×. Among the 50 species in Dataset-B, six species have a relative sequencing depth 6×, five species have a relative sequencing depth 8×, another five species have a relative sequencing depth 10×, the remaining species have a relative sequencing depth 1×. Details of Dataset-A and Dataset-B are listed in Table 3. Simulated datasets of very high abundance (read length is 75 bp on average). Considering that MetaCluster 5.0 works well only with extremely high abundance short reads, we also generated five datasets with 3000 k reads of 128 bp on average for comparing our method and MetaCluster 5.0. These datasets are denoted by C, D, E, F and G, and are presented in Table 4. Simulated datasets of extremely high abundance (read length is 128 bp on average). We downloaded an Acid Mine Drainage metagenomics dataset from (NCBI)  to evaluate the performance of our method as this dataset has been well studied. The real dataset consists of 2534 contigs with an average length of 5000 bp, which were assembled by 103,462 high quality trimmed reads . The dataset includes annotated sequences from 5 known species: Leptospirillum sp.Group II, Leptospirillum sp.Group III, Ferroplasma acidarmanus Type I, Ferro-plasma sp.Type II and Thermoplasmatales archaeon Gpl, as well as some sequences from unknown species. The five species belong to two superkingdoms and three genera, and they form the taxonomy showed in Figure 4. Since the original reads do not have species annotations, we use the 2534 annotated contigs to test the binning performance of our method. As is known, it is difficult to evaluate the performance of a binning method on sequences from unknown species, so we removed these sequences that do not belong to any known species, and eventually got 2424 contigs, which constitutes the dataset R1. The taxonomy of species in R1. To evaluate the binning results, we consider three measures: Precision (Pr), Sensitivity (Se) and F1-measure (F1). Assume that a metagenomic dataset comes from N species, and finally is grouped into M clusters, R ij represents the number of reads in the i-th cluster that are from species j. S e = ∑ j = 1 N max i ( R i j ) ∑ i = 1 M ∑ j = 1 N R i j + number of unclassified reads . F 1 = 2 * P r * S e P r + S e .
Probabilistic topic model is an unsupervised technique. Topics in the model are latent, which means that we have to set the number of topics for a dataset as an input. Here, we check how the number of topics used in the LDA model impacts the binning performance of TM-MCluster. We use dataset D12 where the reads are from five species, and vary the topic number from 2 to 100. The results are illustrated in Figure 5. We can see that our method achieves the best overall performance when the topic number is 20. When the topic number is set to 2, the performance is the worst. It is reasonable that a too small number of topics may cause the loss of information, which thus degrades the performance. On the contrary, a too large number of topics may introduce noise, which may negatively impact the performance. From the experiments over a number of different synthetic datasets, we found that when the number of topics is set to values between 20 and 100, we can achieve satisfactory performance. The effect of topic number on binning performance of TM-MCluster. First, we compare our method with MetaCluster 3.0 and MCluster on four evenly distributed datasets D1, D8, D11 and D13 with 2, 3, 5 and 10 species, respectively. Results are shown in Table 5. As we can see in Table 5 on three of the four tested datasets, our method achieves the best F1; and on two of the four tested datasets, our method obtains the best precision or sensitivity. Results on simulated datasets (D1, D8, D11 and D13) with identical abundance ratio. Each bold value indicates the best result on a certain dataset. We then check the performance of our method on the 12 unevenly-distributed datasets, the results are shown in Table 6. Out of the 12 tested datasets, our method achieves the best F1, precision and sensitivity on 10, 6 and 5 datasets, respectively; and MCluster ranks first in F1 and sensitivity on 3 datasets, while MetaCluster 3.0 outperforms the others in precision and sensitivity on 7 and 5 datasets respectively, but it does not perform best in F1 on any dataset. It is worth mentioning that the advantage of our method seems more outstanding on datasets with unevenly-distributed reads. Results on 12 unevenly-distributed datasets. We go further to examine the performance of our method on datasets of relatively-high abundance. As AbundanceBin works only for high abundance datasets, here we compare our method with AbundanceBin and MCluster. The results are shown in Table 7. Out of the 10 tested datasets, our method achieves best F1, sensitivity and precision on 9, 6 and 8 datasets, respectively; MCluster obtains only 1 best F1 and 2 best precision; and AbundanceBin gets only 4 best sensitivity. This result shows that our method performs better than the other methods on high-abundance datasets. Results of on high-abundance datasets. In reality, more and more metagenomic datasets are short reads (about 100 bp), so we also evaluate the ability of our method to deal with short metagenomic reads. As MetaCluster 3.0 does not work well on short reads, we present the results of AbundanceBin, MCluster and our method on Dataset-A and Dataset-B in Table 8. Comparing with AbundanceBin and MCluster, we can see that TM-MCluster achieves the highest F1-score and the best precision, which is roughly consistent with the results of our method on datasets of long reads. Binning performance of AbundanceBin, MCluster and TM-MCluster on short reads (75 bp average) datasets: Dataset-A and Dataset-B. The bold values are the best precision, sensitivity and F1-score. As binning large metagenomic datasets usually consumes a lot memory and time, here we present the memory and time costs of AbundanceBin, MCluster and our method on Dataset-A and Dataset-B in Table 9. We can see that AbundanceBin consumes the least memory, while MCluster runs fastest. As training LDA is time-consuming, TM-MCluster uses the most time and memory. Memory and time costs of AbundanceBin, MCluster and TM-MCluster on short reads (75 bp average) datasets: Dataset-A and Dataset-B. Performance comparison: TM-MCluster vs. MetaCluster 5.0. Here we test our method on the real dataset R1. Referring to Figure 4, we know that reads/sequences in R1 belong to two superkingdoms, three genera and five species. So we predefine the number of clusters for AbundanceBin, MCluster and our method to 2, 3 and 5, respectively. As for MetaCluster 3.0, it can automatically decide the number of final clusters, we do not predefine the cluster number. For our method, the number of latent topics is set to 100. Finally, MetaCluster 3.0 outputs two clusters. All results are presented in Table 11. Though MetaCluster 3.0 can automatically output the number of clusters, its result is not accurate, because there are five (instead of two) species in R1. For the other three methods, AbundanceBin achieves the best sensitivity, but its precision is the lowest. Our method has the best F1. For each input number of clusters, our method achieves the highest F1-score. Especially, when the number of clusters is set to 5, exactly the number of species contained in the dataset, among the four methods, our method achieves the best precision and F1, and the second highest sensitivity (only smaller than that of AbundanceBin). Results on the real dataset R1. For AbundanceBin, MCluster and our method, as the input number of clusters increases from 2 to 5, the binning performance generally shows a degrading trend. The reason is like this: when the number of clusters is set to 2, 3 and 5, it is assumed to cluster the reads at superkingdom level, genus level and species level, respectively. At a higher level (e.g. superkingdom), the distance between the centers of any two clusters is generally larger than that at a lower level (e.g. species), so it is easier to group reads at a higher level than at a lower level. In this paper, we propose a new approach for binning metagenomic reads. The new approach TM-MCluster combines k-mer representation, topic modeling and automatic feature weighting together to boost the performance of metagenomic data binning. Experiments over both synthetic and real datasets have been conducted. The experimental results show that the new method achieves better overall performance than four existing methods, including AbundanceBin, Metacluster 3.0/5.0 and the latest MCluster method. This work indicates that the exploitation of topic modeling can effectively improve the performance of binning metagenomic sequences. This work was firstly presented at the 10th International Symposium on Bioinformatics Research and Applications (ISBRA 2014), June 28-30, 2014, Zhangjiajie, China. And later a one-page abstract of this work with similar title and authors was included in the Proceedings of ISBRA 2014, Vol. 8492, LNCS, page 389, Springer, 2014. This work was supported by China 863 Program (grant No. 2012AA020403) and National Natural Science Foundation of China (NSFC) under grants No. 61173118 and No. 61272380. Shuigeng Zhou and Jihong Guan conceived the study, and revised the manuscript. Ruichang Zhang performed all experiments and data analysis, and drafted the manuscript. Zhanzhan Cheng prepared the datasets.